A fresh wind flow of God's comfort, peace, and healing. Poetic melody fused with vivid sound imagery & music. "A Fresh Wind flow of God's Comfort, Peace, and Healing"
Experience the anointed collaboration of Spoken Word, melody, and music . . . A journey that takes you to poetic places of praise . . . authored by God . . . presented by Prophetess Zanderland Asante. Zanderland's voice flows with all of God's instruments . . . from the trumpet to the violin. This project offers Scriptures, poetic short stories symphonic poems, melody, "vivid sound imagery", and music. God's Poetic Orchestra is now being shared internationally in Africa, Europe, Asia, and South America! CD 1 Seed for the Heart . . . Gives you poems and messages of inspired Word and melodic sounds. Track Highlights . . . Hearts in His Garden, Sweet Love Garden, True Witness, and The Way. Get ready to receive nourishment from God's promises. "For the Word of God is living and powerful . . ."
CD 2 Symphonic Melody . . . Brings a unique blend of Spoken Word, music, and melody to the Gospel canvas. Track Highlights . . . Running with the Fresh Wind is an anointed poetic testimony blending with music (composed/produced by Gilbert Mulamba). Savior Divine allows you to dance in praise while being blessed by the story of our Lord and Savior Jesus Christ. Part of the poem was written by Zanderland's grandfather (Pastor Joseph H. Dixon) more than 60 years ago (produced by Denver A. Wright with music composed by Chris Hall). Let the Little Children is a message set to a very smooth, yet upbeat musical mix for the younger generation. This track features Zanderland's son, Kofi (produced by Rodney Dixon). The enhanced CD feature allows you to view photos and bio while listening to the Savior Divine track on the computer. 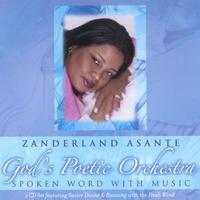 God's Poetic Orchestra is the sophomore project produced and published by Trumpet Angel Media/Creative Seasons Publishing, founded by Zanderland. Zanderland Asante . . . Minister, wife, mother, CEO, music label President, and Executive Producer. " As I run the race set before me, God gets all the Glory." Part of the proceeds will benefit the Trumpet Angel Coalition (formerly Hearts in His Garden Ministries), an organization dedicated to encouraging & helping children. To learn more go to www.trumpetangel.com. For additional information about Zanderland Asante and Trumpet Angel Media, contact the ministry at zasante@trumpetangel.com or call 512-535-7763(Austin, TX). Go to www.trumpetangel.com.